Category Archives for "10+ Person Tent"
What is your thought about arizona gt tent? Well, let me say something: Getting a reliable and bigger tent is a good move before going out group camping because doing so assures you that the possibly harsh conditions experienced outdoors can be handled well. But as the number of best family tents on the market continues to increase, selecting the best from what’s available might not be that easy. Due to this, outdoor experts recommend that buyers should stick to reliable products, just like the Arizona GT Sports Camping Tent. The Arizona GT Sports Camping Tent is a popular family camping tent. It’s capable of accommodating up to 10 occupants. 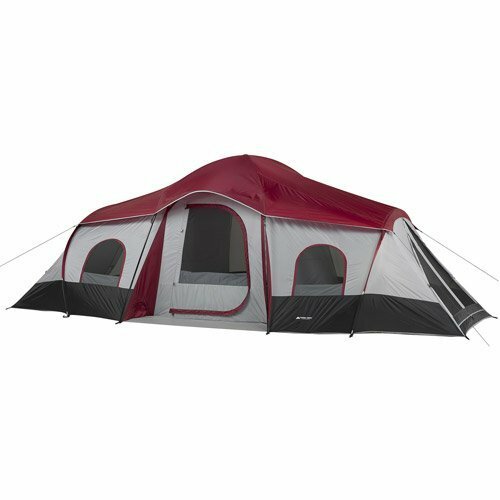 Its center height is about 6.7 feet which provide an ample amount of headroom for the occupants to comfortably stand whilst inside the tent. The Arizona GT Sports Camping Tent is made of durable polyester. The outer material is Polyester Taffeta 68D while the interior is Polyester Mesh. It has a detachable room divider that divides the tent into two rooms for privacy and comes with 2 doors and 3 windows that are responsible for keeping the tent well-ventilated. In terms of durability, the Arizona GT Sport Camping Tent is a top performer. Its materials are durable enough to withstand rain and strong winds outdoors. The polyester used in it is relatively thin but fire-retardant. It’s equipped with Nano-flex fiberglass poles with lesser memory but extra strength necessary for flexibility and stability. In addition to that, the tent’s other metal parts and ferrules are gold-plated, making them resistant to rust. Unlike the other, bigger tent models, the Arizona GT Tent can be easily assembled and disassembled. Arizona does not require any tools since the poles can be easily connected and slipped through the polyester sheet. It also comes with durable ears where the strings can be attached and tied to the pegs for added stability. Many group campers consider the Arizona GT Sport Camping Tent a good buy due to its functional design, stable construction and fire-retardant material. In addition to that, the tent can be easily set up and carried even along long trails. Aside from the Arizona GT Sport Camping Tent, the Wenzel Timber Ridge Tent- 10 Person and Mountain Trails Grand Pass Tent – 10 Person are also popular since both of these are capable of accommodating up to 10 sleepers. Some of their characteristics, however, differ in certain ways. The Wenzel Timber Ridge Tent- 10 Person is family camping tent equipped with a comfortable walk-in design, high-ceiling construction and 2-room layout. Arizona has a floor area of 160 square feet which is enough for 10 occupants. It has 2 “D” doors in the front and back and windows on the sides that provide the tent with good ventilation. And also Arizona provides a stable structure when assembled and prevents water from coming in. The Mountain Trails Grand Pass Tent- 10 Person also belongs to the family camping tent category. It’s made of nylon and can conveniently accommodate 10 sleepers. Arizona has 2 “D” doors with hoop fly frame that protects its occupants from the rain. And it’s windows and doors have mesh that allows fresh air to enter the tent and keep it well-ventilated. But despite the similarities among their features, many campers still go for the Arizona GT Sport Camping Tent since this provides a few advantages the other two do not. Although the family camping tents provided above are almost identical when it comes to basic features, the Arizona GT Tent still remains the best option among the three since it has a more functional design. The waterproofing and the ventilation system it provides are more effective compared to the other two. Finally, the Arizona GT Sport Camping Tent is the only product among the three which is made of a fire-retardant material. Group camping is currently one of the most popular activities among friends and families. This is because the activity is a good way to strengthen the bonds between friends or family members, most especially when the group dwells in a single tent. Given that this tent needs to hold many occupants, a lot of group campers go for larger tents with dividers and with this consideration in mind, the Ozark Trail 10-Person Cabin Tent often becomes one of their top options as a best family tent. The Ozark Trail 10-Person 3-Room XL Family Cabin Tent is a large tent which is ideal for group campers. It’s designed to accommodate up to ten sleepers or three queen-sized mattresses, plus a spare room. The tent can be effectively divided into three rooms by using a durable divider which is included in its package. The divider provides the occupants of each room the needed privacy that allows them to rest comfortably. The Ozark Trail 10-Person 3-Room XL Family Cabin Tent comes with three doors. One of the doors is located on its center while the other two are on the sides. The side doors provide the occupants with separate entrance and exit points, which also help in maintaining privacy. The tent offers a good amount of ventilation. It features six windows that help the entry of fresh air and at the same time flushes the warmer air outside. In addition to that, the windows also provide the occupants with a panoramic view of the camp site and allow them to gaze at the stars in the sky even while inside the tent. Since the weather outdoors might change any time and sudden downpours are very much possible, the Ozark Trail 10-Person 3-Room XL Family Cabin Tent is equipped with taped fly seams. These are responsible for preventing leakage and keeping rain and fog outside the tent. The tent’s floor is designed to provide the occupants with the needed protection from any harmful elements and its waterproof characteristic also helps in preventing water entry into the tent. The product’s assembly and disassembly mechanism is quite convenient because it comes with pre-assembled poles. The assembly can be accomplished alone but it’s better if this is done by 2 people. When fully assembled, the tent becomes very sturdy and stable. The Ozark Trail 10-Person Cabin Tent is definitely a good family camping tent. It can accommodate up to 10 occupants, is fully-waterproof and well-ventilated. It also comes with a divider, six windows and three separate doors for entrance and exit purposes. 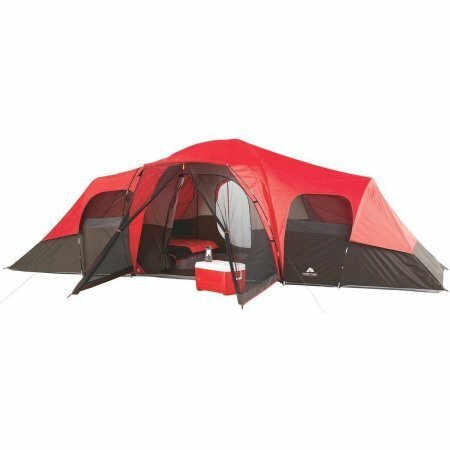 The Mountain Trails Grand Pass Tent- 10 Person and Wenzel Great Basin Tent – 10 Person closely compete with the Ozark Trail 10-Person 3-Room XL Family Cabin Tent. The Mountain Trails Grand Pass Tent- 10 Person and Wenzel Great Basin Tent – 10 Person both accommodate 9-10 people, but the latte is equipped with a divider curtain, two “D” style, mesh roof windows and a hooped fly frame for additional rain protection and a polyethylene floor. The Wenzel Great Basin Tent – 10 Person can also accommodate up to 10 sleepers. It also has “D” style doors and mesh windows. It features a ridge pole that provides an awning for the front door and back window for protection against rain. It’s also equipped with an E-Port and two convenience pockets. Given their own features, the three products seem to provide the same set of features. However, a closer look at the Ozark Trail 10-Person 3-Room XL Family Cabin Tent’s features reveals that it has a number of advantages compared to the other two. Despite of the similarity in the features provided by the three products discussed earlier, the Ozark Trail 10-Person 3-Room XL Family Cabin Tent can be considered the best among the three. This is because the Ozark Trail 10-Person Cabin Tent has a divider that creates three rooms inside the tent while the others can only be divided into two rooms. The Ozark is also more well-ventilated since it has more windows. Finally, the Ozark has 3 separate doors for better entrance and exit purposes while the other have only two doors. 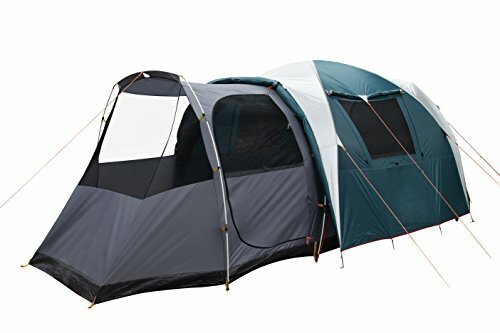 Interested to buy this tent?